Introducing Our Gente's 2nd annual Community Pride Day! 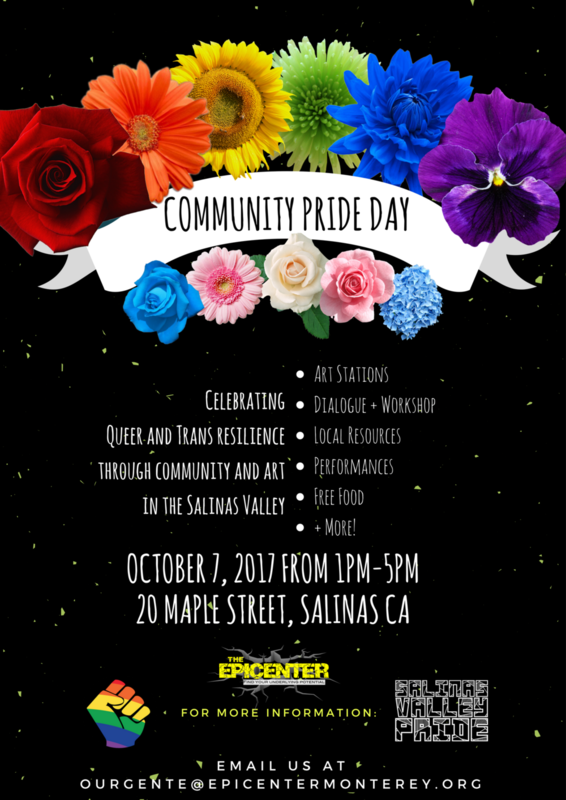 In collaboration and on the same day as Salinas Valley Pride's nighttime celebration, this year's Community Pride Day will have a focus on Queer and Trans Resilience through community and art. We welcome people of all ages to this family-friendly event to enjoy our art stations, dialogue and workshop, local resources, performances, free food and more!! Want more information? Interested in sharing your resources at the event? Interested in performing? Email us at ourgente@epicentermonterey.org or give The Epicenter a call at (831) 998-7291.